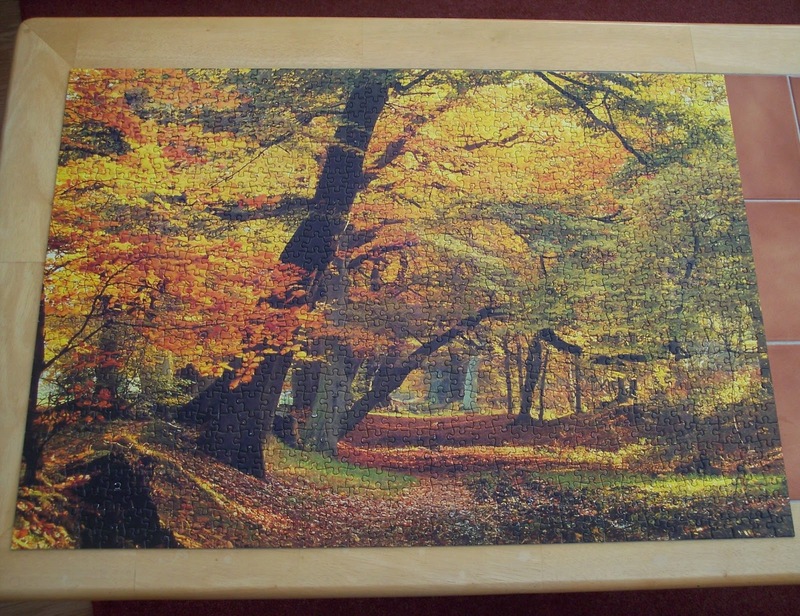 Well autumn is here and as is often the case my mind turns to cosy pursuits like doing jig-saw puzzles. I think I've said before that I've been doing them since I was four or five and have never lost my love of them. I even managed to marry a chap whose 'mother' loved to do them. How's that for convenient? And now I share mine with my daughter and her husband and they give me theirs to do as well. It's always nice to have a hobby that your family shares. Anyway, I know a few people who read this blog also do puzzles so here're a few of the ones I've been doing over the past weeks. As always, click for a larger view. 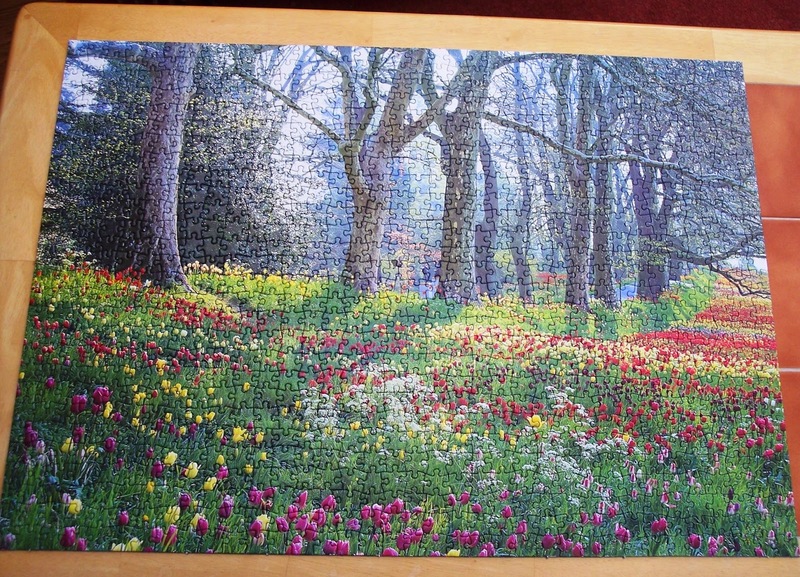 This 1000 piece puzzle is called 'Spring at The Tulip Walk, Mainau, Lake Constance' which is a lake on the river Rhine in Germany. I gather the tulip walk on this island is rather famous - hardly surprising. This was a lovely puzzle to do, quite hard, but I had the help of my grand-daughter to complete it. This lovely autumn scene was borrowed from my daughter. Another 1000 piece one. The photo is of the Ashridge Estate in Hertfordshire, owned by the National Trust. If you go to the site and wait for the slide-show to go through it does show a view a bit similar to this. I gather then that this estate must be famous for its autumn colour. This was another nice one to do, quite difficult as a lot of the colours are similar of course. But it's gorgeous when complete. 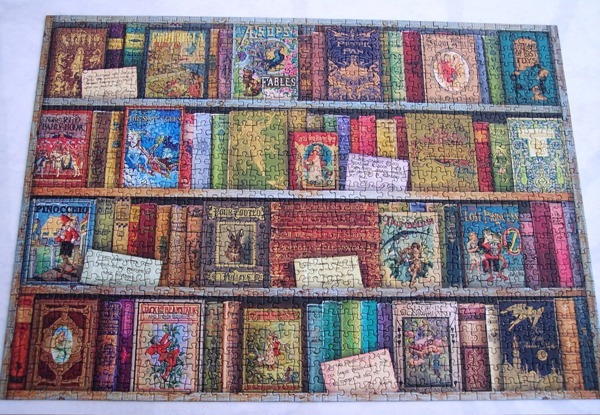 Another shared one, 1,250 pieces, and a charity shop buy. It had a piece missing but that's ok, I knew about it so that's fine. Again it was enjoyable to do. It's called The Astronomer by a certain artist. Unfortunately I've given the puzzle back and can't remember the name. 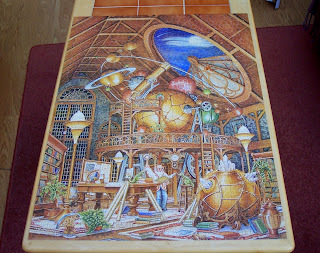 But it certainly was a really fun puzzle to do. Finally, I took a photo of some of the ones I still had to do (before I did the tree one). It looks like I have hours of peaceful enjoyment ahead. I rather suspect there may be others too. I should warn... these sites are *very* addictive! Some short stories for the R.I.P IX 'Short story weekend' today, which I haven't done so far but usually try to do at least a couple of times during the challenge. 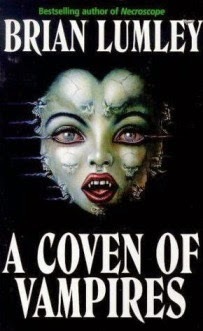 A Coven of Vampires is a book of short stories by horror writer, Brian Lumley. It's my book four for Carl's R.I.P. IX challenge and also my book 32 for Bev's Mount TBR challenge. Perhaps I should apologise for the cover. I didn't think too much of it until my husband told me that the sight of it on the coffee table had been freaking him out all week. LOL!!! Brian Lumley is an English author from the North East of the country, where some of his stories are actually set. I've been reading his books for many years now, probably since the late eighties or early nineties and it always surprises me that he's not more well-known than he actually is. I suspect he's most famous for his 'Necroscope' series of vampire books, none of which I've read right through. I believe I started one, couldn't get on with it and abandoned it. What I do love are his short stories and novellas. Some of those feature another of his creations, Titus Crow, a sort of psychic investigator... again I'm not mad about about those but have read a few and they're ok. Where I think the author excels is in his orginal horror short stories and those of a Lovecraftian 'Chthulu Mythos' theme. A Coven of Vampires concentrates on those two types of stories and was therefore right up my street. Lumley's speciality, it seems to me, is weird tales. He doesn't do ghost stories, he does the kind of macabre tale that chills your blood. Although this volumes purports to be about vampires you won't find Dracula in a black cloak and fangs here. Instead we have other kinds of parasitic behaviour and some of it is very disturbing indeed. In Uzzi a man is involved in a car accident, knocking over a female pedestrian. In her dying moments, the man, wracked with guilt, swears to 'look after Uzzi' thinking this must be a much loved pet. It's not. When he senses that something terrible is sharing his bed with him at night he wonders if he's losing his mind. The Picnickers is one of my favourites in the book. A young boy is staying with his uncle in a seaside village in the North East of England. The village is a pit village and as his uncle is a local doctor, the boy is quite used to tragedy in the form of mining disasters. One such happens and a man dies, swiftly followed by the suicide of his wife. This coincides with the arrival of a family of gypsies whom the boy comes across in the woods. They frighten him with their silence and strange eyes. Ther dead wife wants to be buried with her husband and things come to a head when the coffin of the recently buried miner is found riddled with holes: something has burrowed into it. But how? And why? I liked the use of the boy as the narrator in this and the way in which he sets out to watch the adults and solve a very odd mystery. Good writing and a terrific story, in tone it reminded me of Neil Gaiman's, The Ocean at the End of the Lane. Several Chthulu stories are really rather good - The House of the Temple for instance. A man inherits a house in Scotland, from his uncle, with the proviso that he can only inherit all of his uncle's money if he destroys the house completely within three months. He goes to live in the house with an artist friend, to try and discover what secrets about the house and adjoining deep pond his uncle had unearthed. The Thing from the Blasted Heath is also very good, retelling as it does the story of how a man plants a strange tree in his garden. It's come from a place where a meteor hit some heathland and where nothing will now grow. The tree scares a neighbour with its unearthly glow at night and the owner must try to find out what's going on. Very creepy. Zack Phalanx is Vlad the Impaler! is a bit of a spoof story involving the filming of a movie about Vlad the Impaler in the Carpathian Mountains. The main star doesn't show up for filming which causes mayhem. They use villagers for extras but they're spooked by something and one night disappear altogether. Bit of a crazy ending this one has but is quite good. What Dark God? is set on a British Rail train in the mid 1970s. (I can quite see why that might spawn a horror story...) It involves two chaps sharing a carriage with some very stange people indeed. The ending of this one really chills the blood. All in all a good anthology of creepy stories. Only a couple I felt were a bit average (not 'bad') so out of thirteen that's pretty good; and four or five I thought were actually terrific. Brian Lumley writes very well indeed, in my opinion, sucking the reader into some very strange situations and making you believe they're not that unlikely at all! Reading this has made me want to read more Brian Lumley for RIP. I really like his Chthulu novellas and although I've read several there are just as many I've not read so I'll be looking those out next month. My reading has slowed down considerably this month and this is down to two things... being a bit busier than usual with family and the garden... and doing several jig-saw puzzles. Here we are, halfway through the month, and I've only just finished reading my third book. Given my express-train approach to reading this year that's quite surprising... but not a problem. Sometimes there are other things to do and being *so* one-track minded is perhaps not a good thing anyway. 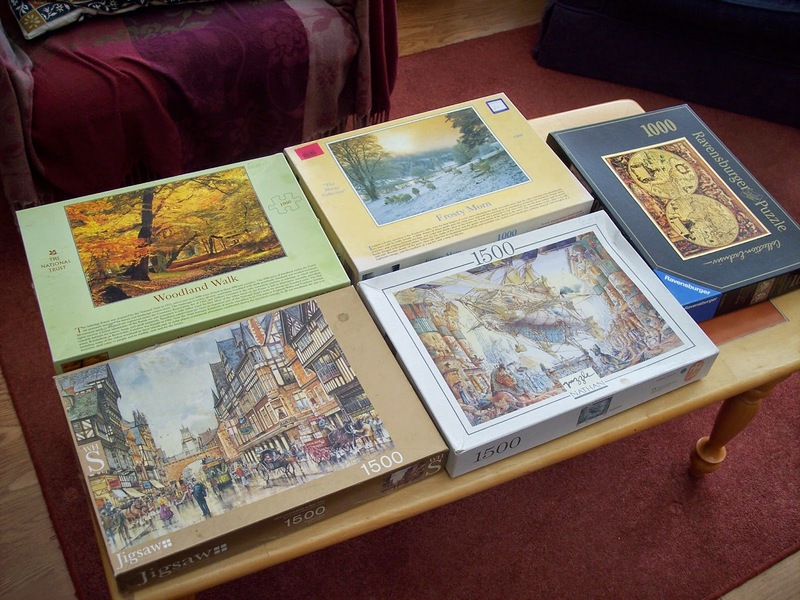 And I do so enjoy time spent with my family and doing the odd jig-saw puzzle. Anyway, onward. My second book for Carl's R.I.P.IX challenge is Silver Borne by Patricia Briggs. It is also my book 31 for Bev's Mount TBR challenge. 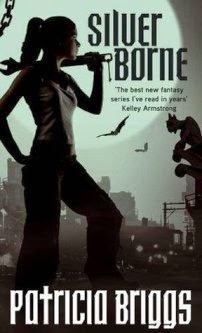 Mercy Thompson, a coyote shape-shifter, is the mate of Adam Hauptman, the Alpha of the local werewolf pack. Naturally it brings her all kinds of problems, some of her own making, some not. She shares a trailer with Samuel, another werewolf, not of the local pack, but whom she grew up with. Generally he's as solid as a rock but suddenly he goes into meltdown and Mercy has to try and help him not get killed by the Marrok (head of the American werewolves) or Adam and the local pack... a wolf with a breakdown being a very dangerous thing. A book Mercy was lent by a bookshop-owning member of the local fae is also giving her problems. A group of bounty hunters come looking for Adam but is that who they're really after? And what has the fae book got to do with this mess? Mercy needs to find answers quickly. Samuel's life is in danger, Adam and the pack are also but are not necessarily helping matters. But is the one in greatest danger actually Mercy herself? It's been a little while since I read a Mercy Thompson book but it's one of my core series where the minute I start reading an instalment I slip back into the universe immediately. Admittedly, they are a trifle samey. Mercy's problems are always compounded by the fact that she never can, straightforwardly, ask for help in the normal way, has to keep secrets from the people she loves and ends up making herself look bad, even though the fault is often not completely hers. Luckily, her relationship with Adam is very strong and he always makes allowances. He's completely adorable to be honest and their relationship is one very real strength of this series of books. I liked the fact that this book tells us more and more about The Fae who, for me, are one of the most intriguing aspects of this series. They're mysterious, secretive and dangerous and I like hearing about the different kinds of fae that exist in this universe. Funnily enough I don't read heaps in the urban fantasy/horror genre. This is because I can't find many series that are worth my time to be honest. Sometimes I find the writing quality to be quite poor or I'm picky about the way American writers write English settings and language. But this is an American writer writing in an American setting and thus I have no complaints whatsoever: Patricia Briggs has it spot on with Mercy and I'm so happy that I still have a couple more of her books to read. 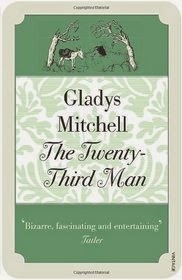 Next, my book three for Carl's R.I.P.IX is The Twenty-third Man by Gladys Mitchell. This also qualifies for Bev's Vintage Mystery Bingo challenge under the category of 'A book by an author you've read before'. This is the second Mrs. Bradley book I've read, the first being Watson's Choice just a few weeks ago. That wasn't bad but this was actually quite a lot better. I think that's possibly because I enjoyed the Canary Islands setting so much. I suspect Gladys Mitchell knew the islands as her descriptions are vivid and gorgeous and would suit a travelogue. There are a lot of characters and I did find myself getting a trifle confused. That's probably just me as the older I get the harder I find it to remember a large group of characters. Regardless of that I found characterisation to be good and I particularly liked Clement, the eleven year old boy whose adopted parents were bringing him up with no discipline as an experiment. He reminded me a lot of Tony from Angela Thirkell's Barsetshire books and brought some nice humour to this story. An enjoyable book that just squeezes into the Golden Vintage Bingo guidelines of being published before 1960, this one being from 1957. I certainly plan to read more in this series. At last I've finished my first book for Carl's R.I.P. IX challenge. It's Hag's Nook by John Dickson Carr. The book also qualifies for Bev's Vintage Mystery Bingo challenge and covers the category of, 'A book with a spooky title'. 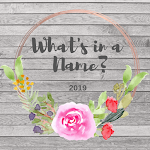 American college graduate, Tad Rampole, is on his way to stay with lexicologist, Dr. Gideon Fell, in Lincolnshire, when he meets a girl, Dorothy Starberth, on the station platform. She's searching for her brother, Martin, but Rampole has to board his train and isn't able to help her find him. He does discover, however, that the girl is headed for the same village as him and is positive he will be seeing her again. Settling in with Dr. Fell, Rampole hears the story of the nearby prison at Chatterham where the Starberth family were traditionally head wardens. 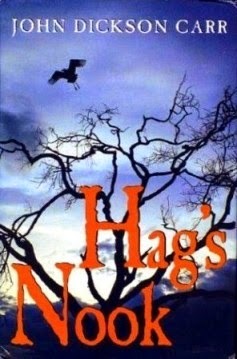 It was built on the site of Hag's Nook where witches were put to death centuries before and is thought to be haunted. It's abandoned now but Dorothy and her brother, Martin, are here because their father died a couple of years ago and Martin now has to undergo an ordeal by which he has to spend a night in the governer's office, open a safe, and discover a secret. Fell thinks the death of the father, Timothy Starberth, was suspicious and feels Martin may also be in some danger because of an old curse on the family. Rampole is very drawn to Dorothy and pledges whatever help he can to Dr. Fell to try and keep Dorothy's brother alive. But will their combined efforts be enough? This is the first book in John Dickson Carr's 'Dr. Gideon Fell' series. I actually read book two, The Mad Hatter Mystery, a few months ago and wasn't that struck to be honest. It was 'OK' but nothing wonderful. 'This' however was a much more enjoyable read. Perfect for R.I.P. in that it was really rather creepy in places. Lots of spooky goings on with the background of the centuries old curse on the family. Scenes with people wandering around the dark, abandoned prison, a deep well with many secrets, unexplained deaths and of course, the threat of The Curse. Some of the characters are very well drawn, Dr. Fell, his strange, bird-like wife, the Chief Constable with his horsey face. Others not so much... Rampole never really came alive for me and Dorothy felt a bit sparsely drawn too. Their romance didn't really convince me either to be honest, but I wasn't reading the story as a 'romance' per se: I was reading it as a crime yarn. Mr. Budge, the butler, was making his customary rounds at the Hall to see that all the windows were fastened before he retired to his respectable bachelor bed. Mr. Budge was aware that all the windows were fastened, had been fastened every night during the fifteen years of his officiation, and would continue so until the great red-brick house should fall or Get Took By Americans - which latter fate Mrs. Bundle, the housekeeper, always uttered in a direful voice, as though she were telling a terrible ghost story. None the less, Mr. Budge was darkly suspicious of housemaids. He felt that. when his back was turned, every housemaid had an overpowering desire to sneak about, opening windows, so that tramps could get in. His imagination never got as far as burglars, which was just as well. The whole book is gently amusing like this, never taking itself too seriously, poking gentle fun at the supernatural mystery genre I suspect, while still being hugely entertaining and great fun. I have more of these Gideon Fell mysteries as ebooks and will definitely read more now that I've enjoyed this one so much.